Dartfish are a family of small, extremely colorful saltwater fish. Most species are vibrantly colored and come in dazzling shades of red, yellow, orange, blue, purple, green and black. They are similar in appearance to gobies and are characterized by their long, eel-like bodies and split dorsal fins. They are a fairly hardy species of fish and adapt quite readily to life in an aquarium. This makes them an excellent choice for most beginner and novice aquarists. They are also highly intelligent and have been a staple in the marine aquarium hobby for decades. Dartfish are a fairly small species of fish and most aquarium varieties only reach a length of around 4 inches. This makes them excellent choices for just about any non-aggressive aquarium all the way down to nano-reef size. They are a a peaceful species of fish and do best when kept in groups of 4 or more. They also make excellent additions to most community aquariums. However, they should not be housed with larger, more aggressive tank mates that could harass or prey on them. Identification: Helfrich's firefish, Nemateleotris helfrichi while rare and expensive, is a stunningly beautiful species that does not present any special difficulties to the experienced aquarium keeper. They are beautifully colored, peaceful toward other fishes (except, in most cases, other members of their own species), small enough to be easily housed in most aquariums, easy to feed, and not at all prone to disease. Firefish pose no threat to invertebrates and are thus ideal for reef aquariums. They are not completely without disadvantages, however. They are relatively shy and should ideally be kept with other fishes of similar temperament. If startled or chased by other fishes, they are likely to jump out of the aquarium so the aquarium should have a full cover. Tank Recommendations: e the best possible aquarium the Firefish requires a 20-gallon or larger system with moderate lighting conditions and a moderate current passing over the live rock "reef." When putting together a tank containing firefish, remember when stressed they will try to jump out of your aquarium. As such, house the Firefish in an aquarium system with a lid. Food and diet: Feed frozen crustaceans of suitable size, such as Artemia or copepods (i.e., red plankton), finely chopped mysis or krill, and fish roe are good staple foods. Flake foods will also be taken provided they are broken into small-enough pieces and preferably presented in midwater, as firefishes sometimes have difficulty learning to feed from the surface. 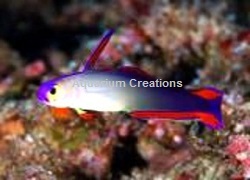 Identification: The Purple Firefish from Maldives is a magnificent little fish that's perfect for reef tanks. These fish have a light lavender colored body with purple markings on their face and towards their tailfin, along with dark red and purple colored fins. The Purple Firefish also has an elongated first dorsal spine that "jumps" up and down. These little fish have lots of personality and should be kept in a tank with lots of rockwork. The Purple Firefish likes lots of crevices, caves, and overhangs where they can "hang" in place. 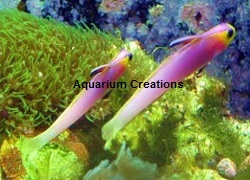 Purple Firefish do best when kept in pairs of 2 or more. 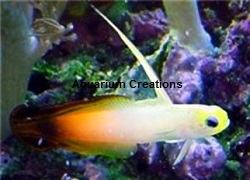 Approximate Purchase Size: Small: 1" to 1-1/2"; Medium: 1-1/2" to 2"; Large: 2" to 3"
Identification: The Orange firefish is a terrific little ornamental saltwater fish that is an inhabitant of reefs where it can be found at depths from 20 to 230 feet. It is usually found just above the bottom, facing into the current, where it awaits its prey of small invertebrates.. With tons of personality and its bright colors they stand out very well in the aquarium. Native to the Indian and Pacific oceans from the eastern coast of Africa to the Hawaiian Islands and from the Austral Islands north to the Ryukyu Islands. In the wild, this fish can be found in groups hovering above the reef, close to its numerous hiding places, feeding on the planktonic food that drifts by in the current. Orange firefish do best as a school of fish from 3 to over a dozen. Of course your aquarium size must be in line with the number of fish you are keeping. The name "dartfish" comes from this fish's habit of darting quickly back and forth and hiding whenever it feels threatened or frightened. It spends its days flitting around the tank, then neurotically diving into cover. Tank Recommendations: To provide the best possible aquarium the Firefish requires a 20-gallon or larger system with moderate lighting conditions and a moderate current passing over the live rock "reef." When putting together a tank containing firefish, remember when stressed they will try to jump out of your aquarium. As such, house the Firefish in an aquarium system with a lid. 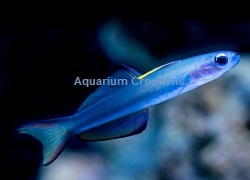 Identification: Blue Gudgeon Dartfish are an active species that make excellent reef inhabitants and they are a great choice for hobbyists of any experience level. Once considered to be rare within the hobby, but have since become a lot more popular and more readily available. An attractive and slender species endemic to tropical reefs throughout the Indo-Pacific. Blue Gudgeon Dartfish generally have an aquamarine to gray-blue base coloration with a black, horizontal blotch at the end of the caudal fin; there are usually yellow-hued areas just above and below the caudal blotch. An extremely peaceful and are known to be rather shy at times, although they are a social species that prefers to live in small groups. Tank Recommendations: A deep sand bed is a must for burrowing, and a minimum tank size of 30-gallons or more will do well to accommodate for their six-inch maximum length. When spooked, P. heteroptera may attempt to jump ship, so make sure you have a tight-fitting lid in place to prevent tragic and unnecessary loss. These are really timid fishes, and putting them in a tank with anything even remotely aggressive will make them hide all day, every day, denying you the pleasure of admiring your beautiful fish! Approximate Purchase Size: Medium: 1-1/2" to 2"; Large: 2" to 3"
Identification: The Scissortail Goby also called the Scissortail Dartfish is a great aquarium choice for the non-aggressive, community aquarium - either fish-only or reef. 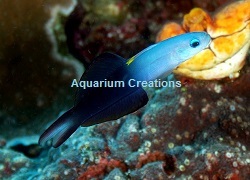 Also known as the Black Fin Dartfish, the Scissortail Goby fish displays no aggression toward other fish, corals, or invertebrates, but care should be taken to ensure that other species do not pick on it. Its maximum size in the wild is around 5.5 inches. The Scissortail Goby prefers clean water and plenty of room to dart about. The smaller sizes sometimes display a black eye spot on the lower rear fin. The Scissortail Goby fish is a jumper and requires a covered aquarium. 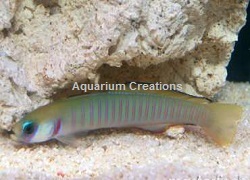 Approximate Purchase Size: Small: 1" to 1-1/2"; Medium: 1-1/2" to 2-1/2"; Large: 2-1/2" to 4"
Identification: The Zebra Barred Dartfish, Ptereleotris zebra is also called the The Shotsilk goby. I believe it is one of the hobby's most under-rated little fish. Also known as the Chinese zebra goby, this is a dartfish and therefore a relative of 'true' gobies. Arguably this is the most attractive of all the dartfish; their slender body exhibiting bright, metallic green coloration, punctuated by vertical stripes of pink with blue facial markings. Their behaviour involves hovering above the reef's substrate in groups, exhibiting a 'nervous' demeanour and always ready to dart to the nearest crevice. These diurnal (daytime-active) fish also use such crevices to sleep in. They can be kept individually, but never seem to look as good as pairs or small groups. Best introduce pairs or small groups at the same time to reduce the possibility of territorial squabbling.P. zebra normally spend their first few days in an aquarium hiding, but soon will emerge if conditions are right. They live normally in the reef's shallow water zone in quite turbulent conditions and will similarly thrive in vigorously-moving water. Approximate Purchase Size: Small 1-1/2 to 2", Medium 2" to 2-1/2", Large 2-1/2" to 3", Xlrg 3" to 4"